Happy October! October brings cooler weather, changing leaves, cozy clothes, pumpkin patches, and Halloween. 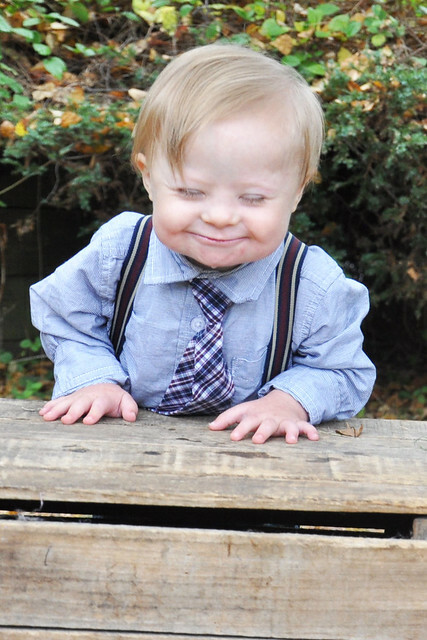 October is also Down Syndrome Awareness Month! 13 months ago, I thought life as I knew it was over. I was worried, afraid, and depressed. I didn't focus on the beautiful baby in my arms. It only took a few hours before I realized just how special our little guy was. Life didn't change in the way I expected. It got so much better! I can't even imagine a world without his breathtaking smile! 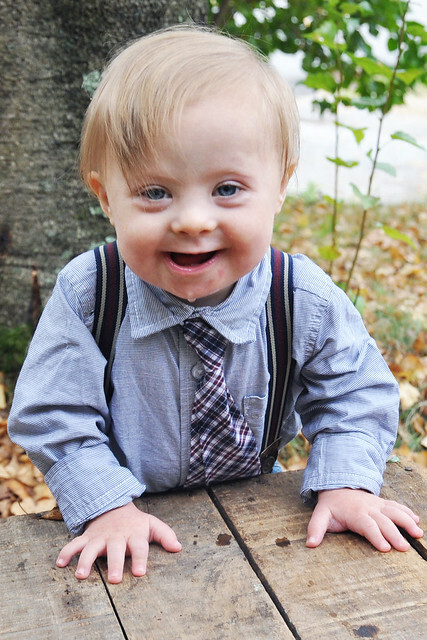 Down Syndrome is just a diagnosis. It does not define who he is. 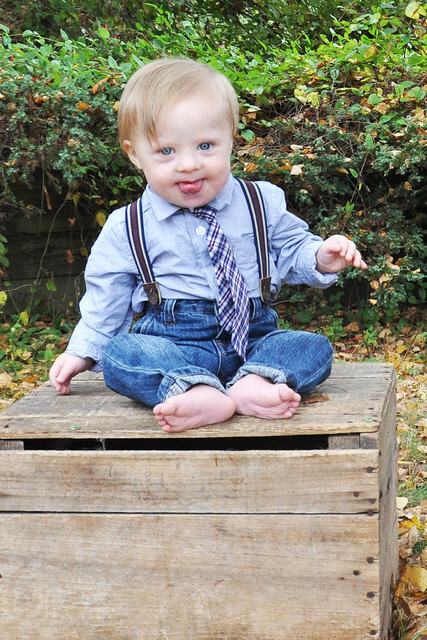 Liam is a 13 month old boy with bright blue eyes, a natural combover, and a contagious smile. His neck is so ticklish that I can't even button his shirt without hearing him giggle. He loves to say mama over and over and over again. He babbles constantly. He loves to eat and feeds himself every meal, no matter how messy. His hugs are like no other. He simply melts into my arms when I pick him up. His face lights up when he sees a person he loves. He loves to look through books and pull toys out of his toy basket. He loves to play with our play kitchen and sit in the grass. He hates having his face wiped and tries to roll away during diaper changes. He loves splashing in the tub. He is aware of everything that is going on around him. He loves to watch people and observe his surroundings. He smiles so big when he sees me. Sometimes, he smiles so big that his eyes squeeze shut. He charms every person he meets. He's completely healthy. He's unbelievably happy. He's ridiculously sweet. He's absolutely beautiful. And he has Down Syndrome. Years ago, parents were urged to keep their children with Down Syndrome hidden within their homes or send them to an institution. Thankfully, all that changed! Awareness is growing and people with Down Syndrome are thriving. Yes, there are those who will call my child ugly and question his right to live. To be honest, I feel SORRY for them. I feel sorry that they are so uneducated and so hateful. I feel sorry that their only way of building themselves up is by picking on another human being. No matter the skin color or the amount of chromosomes, we are all human, we are all equal, and we all have the right to live. 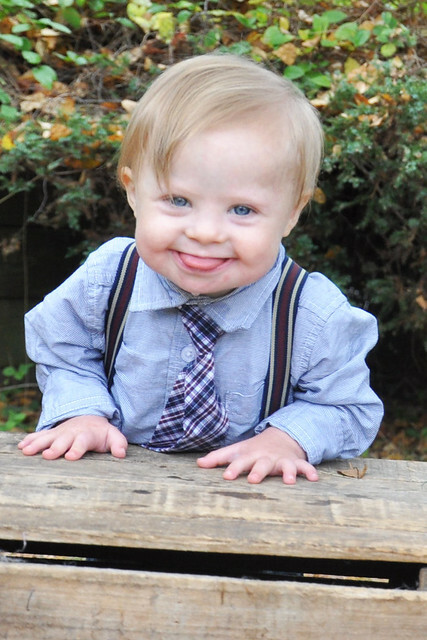 Liam is on a mission to show the world that people with Down Syndrome can and DO live happy, healthy lives! Great Post! We loved Liam before we knew he was a Liam. Before we knew he had down's syndrome. We will continue to love Liam as he conquers the world and changes the face of down's syndrome and people's ideas of what it is! love this! Liam is one lucky little boy to be in such an amazing family!!! He is just so adorable! Beautiful post. Awesome post! I can say with certainty that there is NOTHING ugly about your baby boy. And YAY for awareness! What a beautiful post!!! He is simply one of the most beautiful (and happiest) babies I've ever seen!! Thank you so much! He is a happy little dude! Awww such a cutie and happy baby! You are so articulate Stefanie. This post is perfect and really captures the true essence of Liam. He has a heart of gold just like his mom. 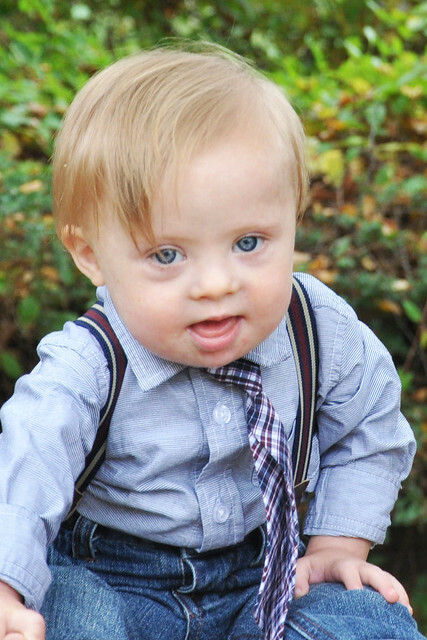 You should be a spokesperson for Down Syndrome Awareness Month! Seriously... So beautiful and touching! Awww, thank you so much! I really appreciate your sweet words!